The Health Minister was challenged to a debate by a Sinn Féin constituency rival. LEO VARADKAR HAS declined the opportunity to debate one of his constituency rivals on Sinn Féin’s economic policies, which he recently described as “barmy”. The Health Minister was challenged to attend a public meeting being hosted by Sinn Féin’s Dublin West candidate Paul Donnelly next week to discuss the government’s “failure” to deal with housing and emergency department crises and hospital waiting lists. Varadkar will be going up against Donnelly in the volatile four-seat constituency at the next general election with the Sinn Féin councillor having come close to winning a Dáil seat in two by-elections since 2011. In a statement issued earlier this week, Donnelly said: “I am challenging the Minister to a public debate. “The people of Dublin West will have an opportunity to decide for themselves whether they want more of the same or an alternative based on fairness and equality. While the Minister is always free to be a regular contributor to the newspapers and other media, I wonder will he so readily available to face his constituents and defend this government’s deplorable failure to deal with the housing crisis, the waiting lists and A&E crisis. Donnelly extended an open invite to Varadkar to attend the first of a series of public meetings he is holding at The Paddocks in the Littlepace shopping centre in Clonee on Thursday, 29 October. But Varadkar said he won’t be attending and launched another attack on Sinn Féin. The Fine Gael TD told TheJournal.ie in a statement: “I have no intention of attending a Sinn Fein public meeting. But I would like to know how Sinn Fein seriously think they can recruit more doctors by capping their pay and increasing their taxes. Anyone on a waiting list should be very afraid of Sinn Fein getting into Government. A follow-up question asking if the minister would be prepared to debate Donnelly in a neutral forum was not responded to. Donnelly said he was not surprised that Varadkar decided against taking up the challenge. He said he would leave an empty chair and space for the minister at the meeting. 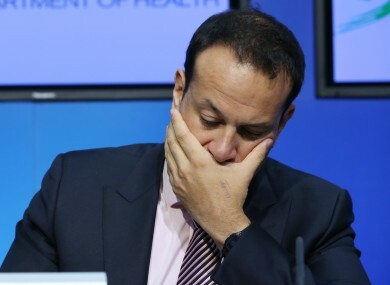 I am not surprised, it’s very easy for Leo to go on the likes of RTÉ and bits of programmes and make one line comments and not be able to stand up and back them and that’s why we challenged him. Donnelly said from those he had spoken to who work in the local Connolly Hospital, it was not an issue of pay but working conditions. “An awful lot of people have left the health service because, in the word’s of one nurse, the third world conditions in accident and emergency departments,” he said. Email “Why did Leo turn down Sinn Féin's debate challenge?”. Feedback on “Why did Leo turn down Sinn Féin's debate challenge?”.